The Summit Fire Department would like to sincerely thank everyone that participated in its US Coast Guard gift card donation drive during the federal government shutdown. During the last week of January, the Fire Department received more than 70 gift card donations that were hand delivered by Deputy Chief Donald Nelson and Chief Eric Evers to the U.S. Coast Guard Base in Bayonne, NJ and to a local Coast Guard family in need of assistance. 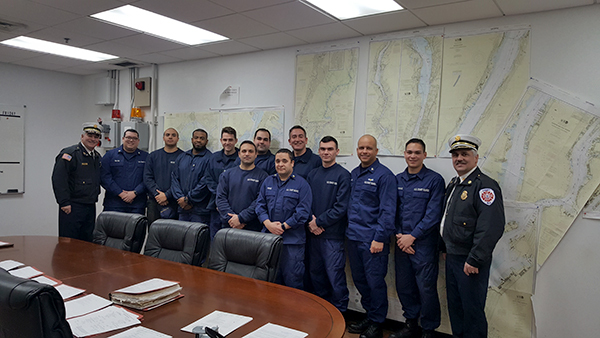 (above) Deputy Chief Donald Nelson (far left) and Chief Eric Evers (far right) pictured with members of the US Coast Guard stationed in Bayonne, NJ.